What Is It That Gauri Did That Got Her Killed? The RSS, VHP, Bajrang Dal, SS, HJS and hundreds of their affiliates do not believe that “everyone has the right to live.” Gauri who was a voice of the oppressed communities and vehemently opposed their plans for a Hindu Rashtra, became their enemy. Gauri Lankesh and her Kannada weekly, Gauri Lankesh Patrike had become a voice of the marginalised and oppressed in the country. Gauri, an activist journalist, vehemently critiqued Hindutva ideology and its politics. The victory of Bharatiya Janata Party (BJP) in 2014 Lok sabha elections strengthened the regressive Hindutva ideology and its institutions, and violence against minorities, dalits and other marginalised communities in the country got a legitimacy. Gauri was one of those who continued to critique the regressive politics of the BJP. Just as any other critic of Hindutva, Gauri was also attacked and threatened on a number of occasions. These attacks and threats did not stop her from critiquing the government and its Hindutva ideology. 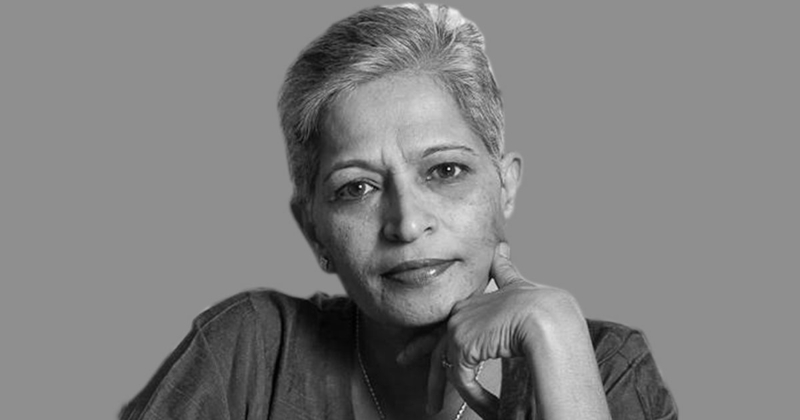 A strong voice against the political assassinations of anti-Hindutva voices and rationalists by the Hindutva forces, Gauri Lankesh was assassinated on September 5, 2017 in Bengaluru. Also read: Who is the Mastermind Behind the Assassinations of the Rationalists? Unlike the cases of political assassination of Dr. Narendra Dabholkar, Govind Pansare, and M. M. Kalburgi, the investigation of the assassination of Gauri has shown some results. The Special Investigation Team (SIT) which has been investigating the case has arrested twelve persons, all affiliated to Hindu extremist and terrorist organisations like Sanatan Sanstha (SS) and Hindu Janajagruti Samiti (HJS). The SIT which had initially denied the direct role of these organisations in the killing, is now saying that it is difficult to rule out their role, not just in the killing of Gauri Lankesh but also in the other three killings. The SIT had filed a 650-page chargesheet before the First Additional Chief Metropolitan Magistrate on May 30, 2018. The chargesheet had accused Hindutva activist T. Naveen Kumar of the SS in the case. The interrogation of Naveen Kumar had led to the uncovering of the involvement of Praveen alias Suchith Kumar from Mangalore. Parashuram Waghmare of Sri Rama Sene, a Hindu extremist group, was arrested on June 12, 2018, and was produced before the 3rd ACMM Court. During the investigation, Waghmare has confessed of agreeing to kill Gauri Lankesh “to save Hindu religion”. SIT has also stated that Waghmare was approached by a certain man to kill Lankesh and save Hindu religion from “destruction” in August 2017. He agreed to it after watching a few videos of Gauri Lankesh, as “her stances on Hindu religion made my blood boil”. The arrest of Waghmare and Amol Kale has brought a larger conspiracy of the SS and other Hindutva organisations to light. The SIT will be filing the final charge-sheet in the case of Gauri Lankesh in the next two months. The investigation so far has established the fact that there exists a larger conspiracy in place to silence dissent, which the Hindutva organisations and the BJP see as the biggest threat to their agenda of a Hindu rashtra. What did Gauri do to get herself killed? As Bhat rightly notes, the Sangh Parivar are functioning at the national level more freely now. RSS Joint General Secretary Krishna Gopal chaired a meeting on May 28, 2018, in New Delhi, to discuss the government programmes and policies. The BJP Vice-President Vinay Sahasrabuddhe, General Secretary Ram Madhav and Secretary Ram Lal; Union ministers Rajyavardhan Rathore (Information and Broadcasting minister), J.P. Nadda (Health Minister), Maneka Gandhi (Women & Child minister), Mahesh Sharma (Culture Minister), Prakash Javadekar (Education Minister) and Thawarchand Gehlot (Social Justice Minister), represented the government in the meeting and met the representatives of the various departments of the RSS. This clearly demonstrates the relationship that the ruling BJP government has with the Hindu fundamentalist body and that it is a mere puppet in the hands of the RSS. RSS is not the only Hindutva organisation in the country. There are hundreds of them in the country now. Even though the Sangh Parivar keeps distancing themselves from the existing Hindu terrorist outfits, it is proven that all of them help each other to keep up with their pledge for “Hindu Rashtra.” The confessions of Waghmare stated in the SIT report not only show the intention behind killing Gauri Lankesh, but also make it clear that there is a machinery functioning behind these planned killings of anti-Hindutva voices. The SIT brought to light the existence of a gang of hardline Hindutva recruits functioning in five states: Madhya Pradesh, Gujarat, Maharashtra, Goa and Karnataka. The same report says that this “unnamed organisation/gang” comprises at least 60 people and has “recruited people from hardline Hindutva organisations like Maharashtra-based HJS and SS. The RSS, VHP, Bajrangdal, SS, HJS and their hundreds of affiliates do not believe that “everyone has the right to live.” The Hindu rashtra blueprint that these organisations are based on, has no place for Muslims, Christians, and those dalits and adivasis who fight back oppression. Gauri, who was a voice of these communities and vehemently opposed their plans for Hindu Rashtra, became their enemy.